The Modero 72 in. double vanity has a simple clean design with a chic Chilled Gray finish and brushed nickel hardware. It is constructed of solid poplar wood and veneer with soft-close doors and drawers that showcase its quality. Match it with the natural beauty and durability of a stone top and you create the perfect vanity ensemble. The Brentwood 49 in. vanity in new walnut is a beautiful combination of modern and traditional design. Constructed of solid poplar wood and ash veneers, special old nickel hardware, soft-close hinges and wood-matched design doors. 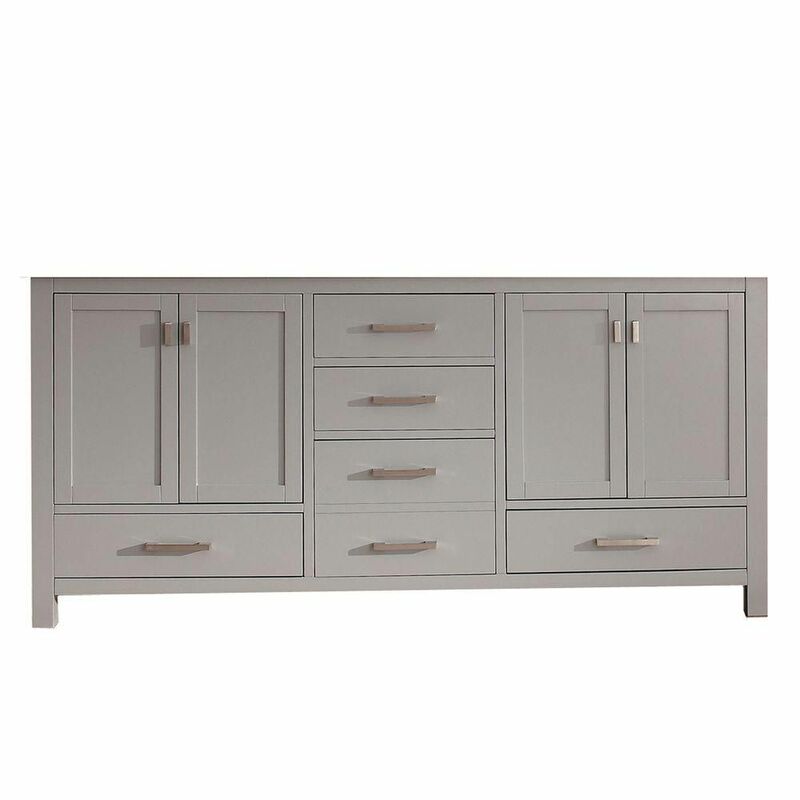 Modero 72-Inch Double Vanity Cabinet in Chilled Grey The Modero 72 in. double vanity has a simple clean design with a chic Chilled Gray finish and brushed nickel hardware. It is constructed of solid poplar wood and veneer with soft-close doors and drawers that showcase its quality. Match it with the natural beauty and durability of a stone top and you create the perfect vanity ensemble. Modero 72-Inch Double Vanity Cabinet in Chilled Grey is rated 4.7 out of 5 by 7. Rated 4 out of 5 by HomeDepotCustomer from The cabinet arrived in time and in good condition, however,... The cabinet arrived in time and in good condition, however, the color advertised is way off - it is a blue gray not the warm gray in the photo. Rated 5 out of 5 by Mark from Color and dimensions were exactly what we were looking for.... Color and dimensions were exactly what we were looking for. Rated 4 out of 5 by Decormom from This cabinet is a very good quality, but unfortunately the picture does not depict the actual col... This cabinet is a very good quality, but unfortunately the picture does not depict the actual color. We were looking for a taupe gray which is what it looks like in pictures. But it is actually a bluish gray just like the Sheffield version of this cabinet. Should have ordered it in white. Rated 5 out of 5 by Stella from Love everything about it I did not do the work myself, but the results are spectacular. I love the way the drawers slide back into place, the solid wood, the color was just what I expected although of course I could only see the picture. The drawers on the bottom are a nice added feature that allow for more storage. All in all I am very happy with my purchase. Rated 5 out of 5 by PinkGirl32 from Absolutely Stunning Vanity! Even better in person. We just remodeled our master bathroom in a gray scheme and ordered this double vanity. We had our contractors install and it's even better in person. All the doors and drawers have the automatic slow close which is great since my husband tends to leave the doors open. Beautiful brushed nickel hardware and solid wood construction. Don't be hesitant to buy this vanity, it's modern and very classy.